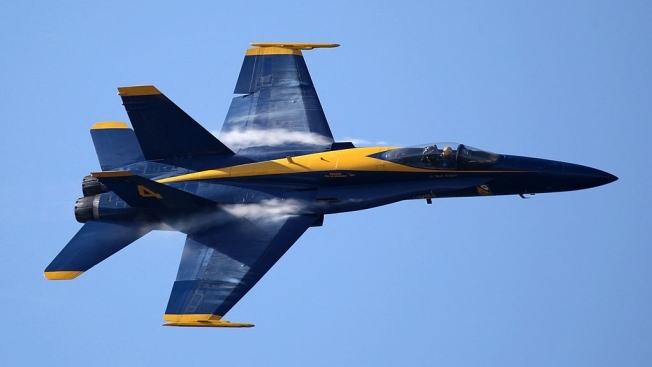 A U.S. Navy Blue Angels F/A-18 Hornet is seen during a practice performance in this October 2009 file photo. The Blue Angels and others are practicing for the Fleet Week Air Show over Baltimore. Participants in the show will practice Friday from noon until about 4 p.m., The Baltimore Sun reports. The Air Force F-22 Raptor, F-35 Lightning and P-51 Mustang, and the Canadian Air Force's CF-18 Hornet are participating in the show Saturday and Sunday. On Saturday and Sunday, the air show over Baltimore's Fort McHenry will take place from 1 p.m. to 4 p.m. The show's finale is a 45-minute demonstration by the Blue Angels.